Israeli Prime Minister Benjamin Netanyahu was to meet with President Obama on Tuesday. (CNN) -- Israeli Prime Minister Benjamin Netanyahu has canceled this week's scheduled meeting with U.S. President Barack Obama, Israeli government officials said Monday. 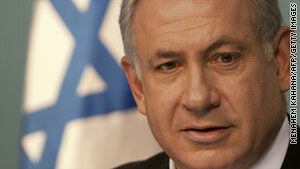 The two leaders were slated to meet Tuesday during a visit by Netanyahu to Washington. Netanyahu also decided to cut short a visit to Canada and return to Israel, according to an e-mail statement from his media adviser. Netanyahu's cancellation of the meeting came in the wake of international condemnation of Israel after Israeli soldiers stormed a flotilla of ships carrying aid intended for Palestinians in Gaza, leaving at least nine people dead in the resulting violence. Israel claimed it was defending itself, with the Israel Defense Forces saying the soldiers' lives were in danger after they were attacked with "severe physical violence, including live fire, weapons, knives and clubs." Several nations, however, have condemned the military action and called for an investigation. Obama spoke on the phone with Netanyahu Monday morning, according to a statement from the White House press office. He "said he understood the prime minister's decision to return immediately to Israel to deal with today's events ... (and) agreed to reschedule their meeting at the first opportunity." Obama "expressed deep regret at the loss of life in today's incident, and concern for the wounded," the statement noted. He "also expressed the importance of learning all the facts and circumstances around this morning's tragic events as soon as possible." The United States signed onto the document, but Obama National Security Adviser Gen. James Jones said the U.S. government has "serious reservations."